Ohio State athletic director Gene Smith took a lot of heat for picking UAB and VCU to make the NCAA tournament over major conference teams like Colorado and Virginia Tech. But it was Smith who got the last laugh when VCU made the Final Four. We shouldn’t be surprised either, as there have been 6 mid-major conference teams to make the Final Four in the past 10 years. And, it says a lot about the parity in college basketball when the Big East gets 11 teams in the tournament and only one to the Final Four, while the lowly CAA and Horizon leagues each advanced a team. Should the NCAA selection committee be picking more mid-majors for the tournament? To answer this question, I looked at NCAA tournament entries over the past 10 years and looked at which conferences advanced the most teams to the Final Four. This would expose which conferences made the most of their bids and which conferences are over-rated. The Big East leads the way with 8 Final Four appearances in the last decade, including Connecticut this year. The ACC (7), Big 10 (6), and Big 12 (6) aren’t far behind. The SEC (4) and Pac-10 (3) lag in comparison. 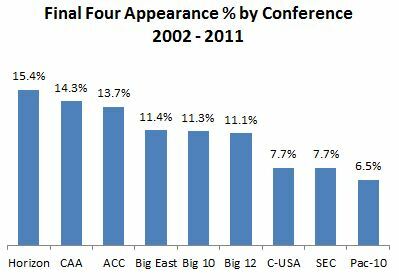 However, we shouldn’t be too surprised by the Big East’s relative success. They’ve had many more teams in the tournament than other conferences (70 in the past 10 years). By comparing Final Four appearances to tournament selections to calculate each conference’s “Final Four Efficiency,” we can determine who is making the most of their tournament bids. Not surprisingly, the Horizon league (Butler) and CAA (George Mason and VCU) have the most Final Four appearances as a percentage of entries. There’s no question there’s parity in college basketball, and it supports the case that smaller conferences deserve more entries into the tournament. Some of the big conferences look terrible by this metric. The SEC and Pac-10 rank at the bottom. The Horizon and CAA conferences made their case this tournament. But not all mid-major conferences are in the same position. Conference USA’s efficiency is near the bottom, and other mid-major conferences like the A-10 and Mountain West haven’t advanced anyone to the Final Four in the last decade. But it’s hard to get teams to the final four if they’re not in the tournament. 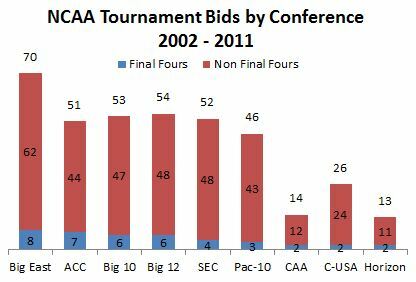 Only 7 at-large bids were given to mid-major schools, and one made it to the Final Four, while none of the 30 at-large berths from the big 6 conferences made it that far. Where should the bids come from. 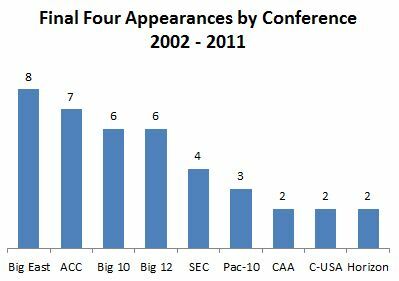 The SEC and Pac-10 have been over-represented in the last decade and clearly don’t deserve as many slots. The Pac-10 in particular has a poor showing, with only 1 school (UCLA) representing them in the Final Four during that time period. And don’t forget they’re diluting the conference by adding Colorado and Utah next year. Gene Smith is on to something. Teams like VCU deserve a shot, their Final Four efficiency proves it, and it certainly makes the tournament more exciting.